The muted sounds of dancing and laughter drifted faintly to Areli, seated in the shadows of the courtyard wall. A nearly empty wine cup sat on the table near his elbow. Only the servants hurrying back and forth with food and drink for the wedding came anywhere close to him, and they didn't pay much attention to the solitary man with the faraway look in his eyes. Areli reached for the wine cup and cradled it in his hands. Then he shifted position so that he could look out across the countryside, away from Cana. Farmlands green with the new spring growth stretched out in the distance. He drained the cup in one swallow and hoped his hired man had remembered to do all the chores. A new season had come. His own fields would be greening up, rich with grain, if nothing happened to kill the crops. Areli knew from experience how close to the edge of disaster farmers lived. The first year of his marriage to Miriam, the harvest had been poor. It had taken two more years of good crops for him to break even, and now he had a chance to profit from his hard work. His hands remembered: grubbing stones from his fields, chopping the weeds out from among the good plants, gathering the harvest in sheaves. Areli studied his scarred, rough hands. Some mornings he couldn't make them move properly. They were stiff and hurt too much. Through it all Miriam had worked beside him. Certainly nothing came easily. The hard work had lined their faces, and Miriam had never been beautiful, as some folks counted it. But she was good--and strong--and Miriam believed in him. That mattered most. Someday she would have fancy clothes, and they would have the money for celebrations and big weddings for their children--if they ever had children. Areli sighed. Three years, and no children. Miriam felt the shame of it more intensely than he did. Others had noticed too. Jebediah, from the neighboring farm, had counseled him to put Miriam away and take another wife. "What!?" Areli snapped sharply, unable to hide his confusion. The two men had been building a rock wall to divert water from the creek to their farms. Areli angrily shoved a rock into place and faced Jebediah. "Miriam cannot give you sons or daughters. She is barren," Jebediah answered matter-of-factly. "The law gives you the right to--." "No!" Areli interrupted, irritated by the suggestion. "The law cannot measure the love between a man and a woman." "Maybe. But we're talking about your future. Without children, who will the farm go to? A stranger?" Speaking evenly emphasizing his words carefully, Areli responded. "I didn't marry Miriam for the children she could give me. I married her because I loved her, and I still do." "Enough! I will not waste my breath arguing. I will not send her away, no matter what the law says I can do. Come. There's work to do." Through one of the windows Areli could see Miriam dancing with happy abandon. He smiled. He would rejoin her in a few moments, but he wanted to fill his lungs with the fresh air of the countryside and rest his mind. The steward appeared suddenly from inside. He talked earnestly to an older woman. The tones of their conversation arrested Areli's attention. "What do you mean there's no more wine, steward?" the woman asked. "Forgive me, but it's true. The other servants just emptied the last skin." "Then send someone quickly to buy more wine in the village." "There isn't any to be found in Cana. That was the first thing I did. We purchased everything in town. What can we do?" the steward asked. Without hesitation the woman responded, "Go and ask my Son to join me here. He is inside with the wedding party." Areli recognized the woman then: Mary, recently widowed from Joseph, the carpenter of Nazareth. Neither Mary nor the wine steward had noticed Areli sitting quietly in the shadows. He knew that eavesdropping was hardly proper, but he couldn't think of a way to leave without attracting attention. The steward returned quickly. Other servants trailed behind him. Following them closely walked a lone Man, Mary's Son, Jesus of Nazareth. Odd rumors had sprung up about Him recently. He had given up carpentry, sold His father's tools, and given the money to His mother to live on. Such an unexpected move drew the curious. Jesus had begun to gather disciples, establishing himself as a teacher. It all seemed very strange. For the moment Areli felt caught up in the sheer presence of the Man. "Hello Mother. It's a beautiful wedding, isn't it?" Jesus smiled. Areli could not miss the pride showing in Mary's eyes. She hugged Him fondly, ever a mother. "Weddings are one of the happiest times. Beginnings are always filled with the joys of hope." "The steward said you wanted to see Me about something important. Is anything wrong?" "They have no more wine, Son." Jesus understood the implication immediately. Custom dictated that the host provide for his guests. A lack of wine, especially in an important celebration like a wedding, would demonstrate not only the host's unpreparedness but also might indicate a lack of hospitality. "Dear woman," Jesus answered, cupping her chin in one strong hand, "why are you telling Me this? My time has not yet come." Even as He spoke to His mother His attention strayed, oblivious to Mary's apology. Jesus' gaze fell on several large water jars used for ceremonial cleansings. At present they all stood as empty as Areli's wine cup. Mary noticed her Son's preoccupied manner and turned quickly to the steward. "Do whatever He tells you to do," she ordered. "As you wish," the man replied, bowing slightly. Mary squeezed her Son's hand as He stood silently looking at the water jars. He smiled down at her, obviously pleased with an idea that had come to Him. "Go back to the celebration, Mother, and don't worry about this. I will take care of it." As Mary slipped away, Jesus ordered the servants to fill the jars with water from the well. They complied, though Areli noticed bewildered expressions on one or two faces. Areli could have slipped away then. Everyone seemed too busy to notice, but he found himself strangely intent on learning Jesus' solution to the problem. The servants worked feverishly, knowing that soon a guest would discover the lack of wine. Jesus urged them on with quick, quiet words of encouragement. Finally each jar stood full, brimming with cold, clear well water. The servants stood back expectantly. 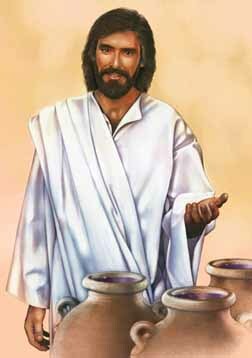 Jesus turned His face to the sky for a few moments, then moving quickly He dipped a finger into the water of each jar. Handing a serving vessel to the wine steward, Jesus said, "Draw from these jars and serve the master of the feast first." The steward filled the container, carefully wiping the lip with a cloth. Even from a distance Areli could see the rich, dark-red Stains on the once clean; white cloth! Astounded, the steward rushed off with the wine. Other servants followed, each carrying his own vessel of wine. Jesus headed toward the house. Overcome with curiosity, Areli left his hidden nook and went to the jars. He filled his own wine cup with the deep red liquid, amazed at the miracle he had stumbled on. Areli spun around, the wind in his cup sloshing over the rim. Jesus, a cup in His hand as well, stood near him. "C-certainly," Areli managed to stammer. Jesus seemed not to notice his discomfort but filled His own cup and raised it. "What shall we toast?" Jesus asked. "To life," Areli suggested, "and the happiness of the newlyweds." Jesus smiled, and they sipped the wine. The taste surprised Areli It seemed to sparkle on his tongue. It was the taste of new wine--fresh and clean and full of life. "I propose another toast to add to yours," Jesus said. A penetrating gleam lighted up His eyes. "To your children, and their children after them." "But--" Areli began. Then he understood. He lifted the cup and drank happily, long, and deep.